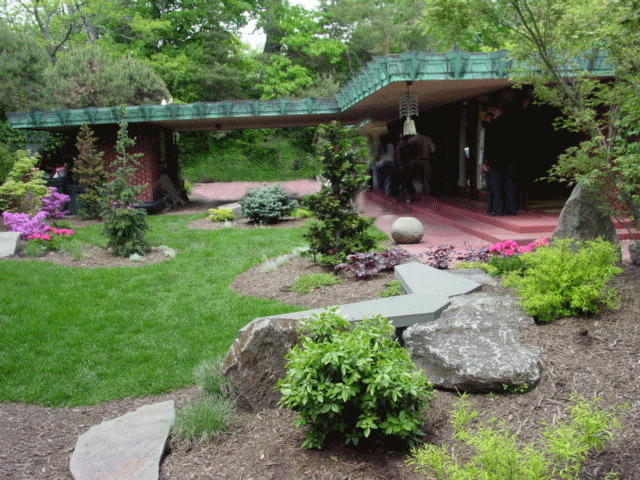 I once thought I might like to write an article about a Frank Lloyd Wright landscape. My hometown of Tulsa has a FLW house, Westhope (which no one is allowed to enter, or perhaps I am simply not well-connected enough to enter) and a set of intriguing old photos of its gardens I once found in an archive remain in my memory as an unrealized garden history dream. Westhope is one of Wright's squares, and I like Wright best in squares, not in the triangles he later adopted as a guiding geometry. 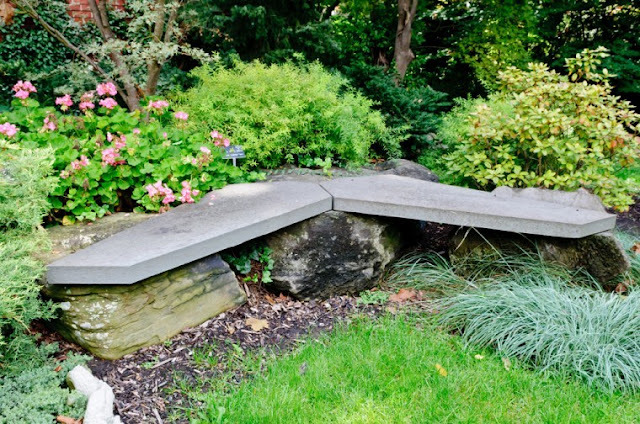 But I recently ran across this garden bench from his 'Samara' house in West Lafayette, Indiana., whose assymetrical polygons give the standard boulder-and-seat arrangement a great mid-century vibe. I could do this! I really like the very precise shape and hard edges juxtaposed with the natural rock and soft garden elements. Interesting angle. Leaves me wondering about Golden Proportions. Hi, garden history girl. I don't see a "contact me" place on your site, so I hope you don't mind my using your comments sections to ask a question. I was reading another garden blog, Transatlantic Gardener, and he was wondering if anyone knew the origin of the name of the plant Nepeta Walker's Low, since it's anything but low growing. Thought you might know! Thanks!